Miquel Ortega being accompanist at the Teatro de la Zarzuela, back in 1991, He began composing an opera based on the work of his admired Federico García Lorca. 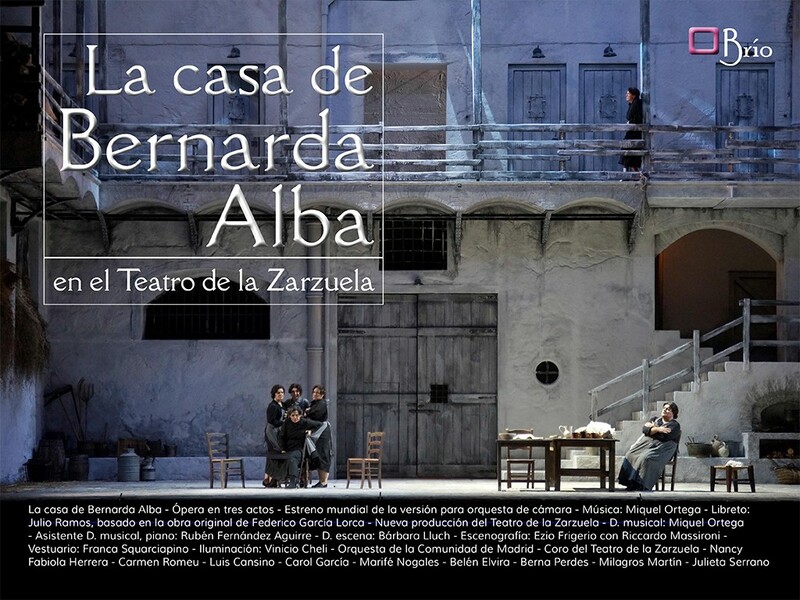 It was nothing less than "The House of Bernarda Alba". In a few months the first act was finished. From now on, and because of the numerous commitments that he was acquiring the composer, his work went on for 8 More years. It was a chamber opera in its original composition 14 musicians, mode the Britten chamber operas. But in 2007 He came the opportunity to release it with the condition than in version for symphony orchestra in the theater of the Romanian city of Brasov. Then come the Festivals of Santander and Peralada.Llega now the Teatro de la Zarzuela in a new production version for chamber orchestra, as it was conceived at the outset by Miquel Ortega. And for the first time in a Spanish language version. Julio Ramos's libretto is absolutely respectful of the play. Almost exclusively so do not leave time, some scenes and character were eliminated Prudencia. Ortega creates a score to match the play. Something not easy with such a complex and full text of more wrenching drama of Lorca. Ortega music, does nothing but enhance the drama, creating a distressing and oppressive atmosphere. Giving life to the other main character is the house and the great Ezio Frigerio, Riccardo Massironi, They have managed to capture in a scenario that the applause was nothing the curtain rises, in recognition of the loyalty of that suffocating space where the tragedy will take place. Frigerio describes it: "It has some convent, some prison, something not seen and have to feel. " The scenery is enhanced by the costumes of Franca Squarciapino you saw all those women tormented describing perfectly by her outfit. Not missing anything left over in an accurate reading that brings credibility to the representation. The same goes for lighting Vinicio Cheli and the great stage director Barbara Lluch. Among the four they compose the perfect scenery naturally, without fanfare or adornment, as only make great. 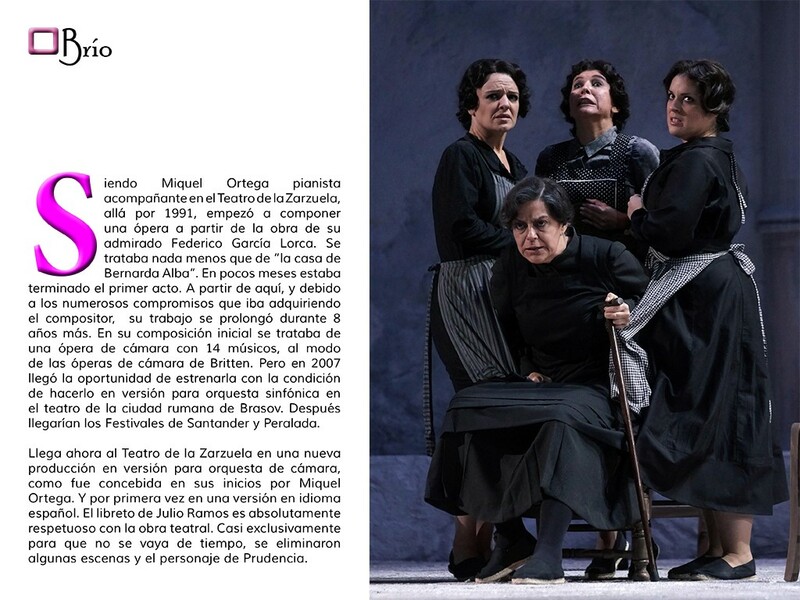 Nancy Fabiola Herrera is the Bernarda Alba this production, It is delivered to rigorously character, both vocal and interpretative. 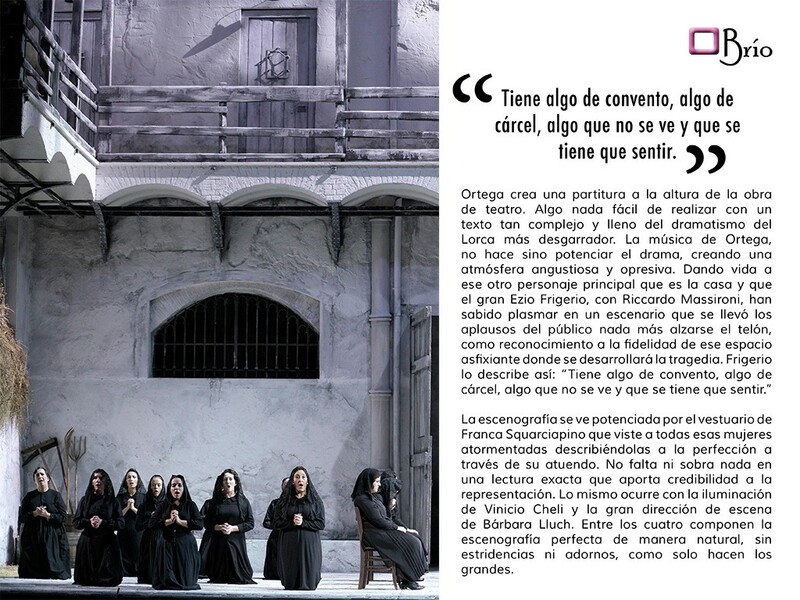 It is a relentless and ruthless Bernarda. Impress their sentences at the end of the work She died a virgin!, referring to her daughter Adela, to listen to startle. In this version, Daniel Bianco free to offer the teacher the opportunity to make a change in one of the main characters of the play took. 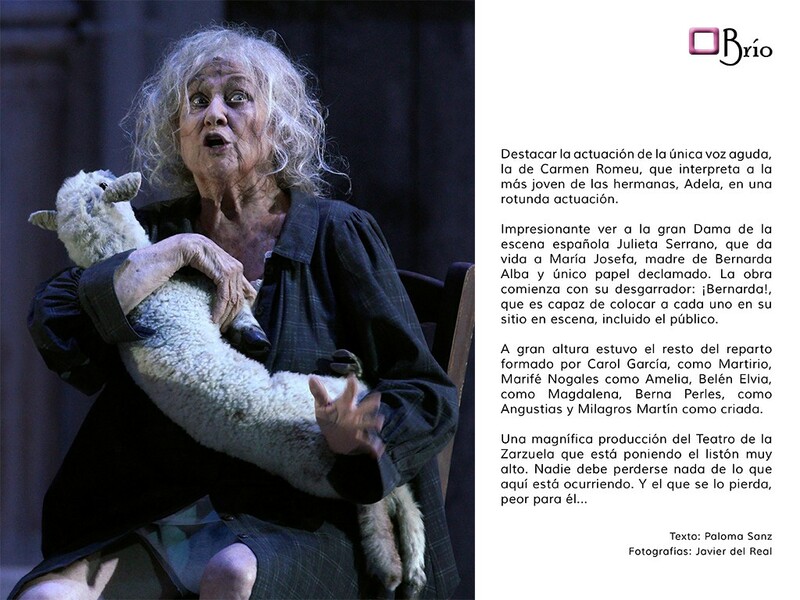 Poncia, the maid of the house which maintains a curious relationship with Bernarda. 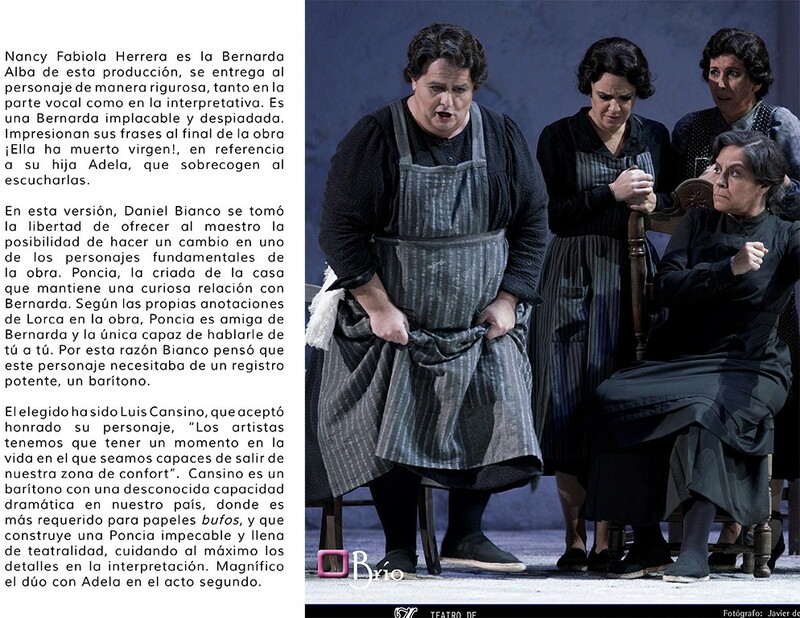 According to Lorca's own annotations in the work, Poncia is a friend of Bernarda and only able to talk face to face. For this reason Bianco thought that this character needed a powerful record, a baritone. The chosen was Luis Cansino, who accepted his character honored, "Artists have to have a point in life where we are able to get out of our comfort zone". Cansino is a dramatic baritone with an unknown capacity in our country, where it is required for papers bufos, and building a flawless and full of theatricality PONCIA, taking care of the details in the interpretation. Gorgeous duet with Adele in the second act. Highlight the performance of the only high-pitched voice, the Carmen Romeu, who plays the youngest of the sisters, Adela, in a resounding performance. Impressive to see the grande dame of the Spanish scene Julieta Serrano, who plays Maria Josefa, mother of Bernarda Alba and unique declaimed paper. The play begins with its heartbreaking: ¡Bernard!, which you are able to place on your site each stage, including public. A high rise was the rest of the cast made by Carol Garcia, as Martirio, Marife Nogales as Amelia, Bethlehem Elvia, Magdalena, Berna Beads, Anguish and Miracles like Martin as a maid.